The last large expensive VW saloon I remember driving was the Phaeton. This huge and expensive car was aimed at stealing sales away from the S Class, it was full of tech and gadgets but it just didn’t sell in the numbers VW expected it would. I suppose where I’m coming from is if you mention buying a VW most people instantly think Golf or Polo AKA ‘people’s cars’ and not great big expensive luxo barges! In its defence the Phaeton was as good as the S class with excellent engineering. The chairman of VW Ferdinand Piech decided to take on the S Class because Mercedes announced it wanted to introduce the A Class to compete with VW. Mr Piech had a list of parameters he wanted his designers to fulfil, one of the more interesting things he wanted was the car to be able to be driven all day at 300kmp while it was 50c outside and he wanted the cars internal temperature to be 22c. Unfortunately even with all of this engineering and technology, the Phaeton just didn’t steal many sales away from Mercedes and it was quietly dropped from the range. 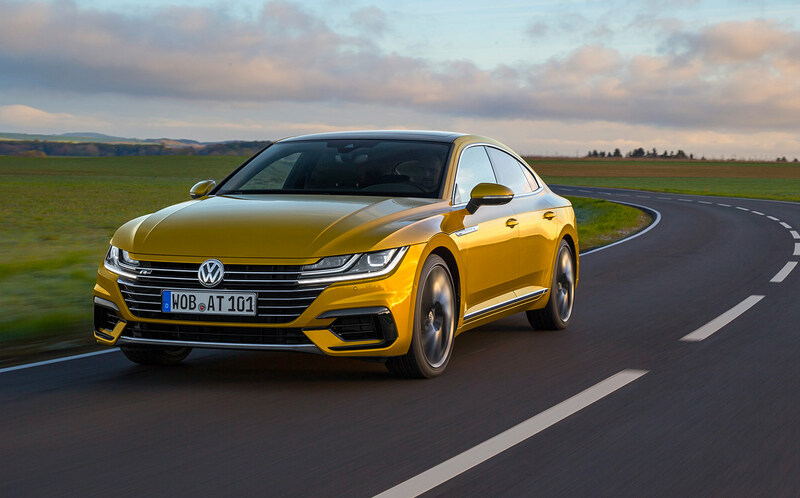 VW’s latest foray into a new market is with the beautiful looking Arteon, this stunning looking car is firmly aimed at the BMW 4 series and the A5 sport back. This car gives you a glimpse of how all new VW’s will look in the future, the Arteon is the new successor to the Passat CC, not only is it longer and slightly wider but it is also very luxurious indeed, though there is a £5k premium over the CC. The car I drove was the R Line version and it was very sporty looking indeed and the car’s interior was up there with its competitors. The dash is dominated by a large touchscreen Sat Nav and infotainment system. I loved the new digital dashboard, the car also has apple play and you can have hours of fun safely sending and listening to messages while you’re driving. The car is available with a choice of two diesel engines or two petrol engines, at the moment a 2lt petrol engine tops the range. All Arteon’s are fwd but the range topping cars have the option of four wheel drive. I drove the excellent 2lt diesel which is expected to be the best selling engine in the range. The 148bhp gets the car to 62mph in 9.1 seconds and its top speed is 137mph, the engines trump card is its excellent economy, most owners should expect to get 60 miles per gallon. My car was fitted with the optional DCC which is priced at £820. If you’ve opted for the rather nice looking 20″ alloys it also helps with the cars ride quality. The car is a great long distance cruiser and motorway miles are handled with ease, my car had the optional panoramic roof which helped make the interior very light and airy. The pillar-less doors not only look great but thankfully due to good cabin sealing there was very little wind noise indeed. Another great feature for long distance drivers is the cruise control; you set the speed and the distance you want to keep between the cars in front of you. The system is so good all you’ve got to do is steer the car and the braking and accelerating is all done for you. Another great feature has to be the speed limit is displayed on the navigation screen; it’s great if you are driving in a new area. The car also features emergency braking at speeds up to 19mph; this is usually the speed at which most accidents occur. The system can be fooled but on a whole it’s a great safety feature. Passengers sitting in the rear of the car have slightly less headroom than the people up front. That has to be due to the cars styling and the rear slope. Boot space is ok for most people, with the seats up there is 563ltrs of boot space and with the seats down this jumps up to 1557ltrs. If your hands are full and the car detects the key a simple wave of your foot under the boot opens it. In a nutshell I think Imelda Marcos would get all of her shoes in the car with the seats down after one of her legendary shopping trips! The car is available in two trim choices, either Elegance or R Line. All cars have the active info display, leather upholstery; three zone climate control, LED headlights and GPS aided adaptive cruise control. The base Arteon is priced from £31k and this jumps up to £39k for the range topping 4 motion 2lt Petrol. After driving this car for a couple of days I really didn’t want to give the keys back. If you do plenty of motorway driving or you’re after a stylish looking car then look no further as this car ticks all the boxes.